Choose between Antique Brass or Titanium White over solid cast brass. Rounded style. Choose between Antique Brass or Titanium White over solid cast brass. Low profile - Ideal for mounting on fences and stair risers. Patented. 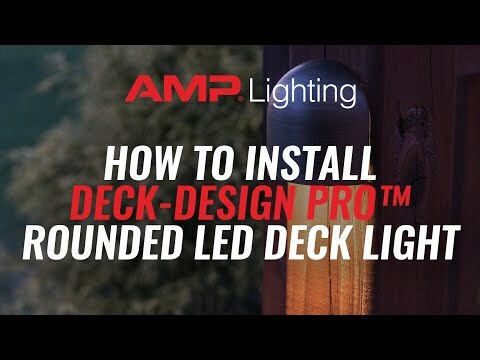 The AMP® Deck-Design Pro™ Rounded LED Deck Light is an attractive solid cast brass fixture that features a rounded shape similar to cylindrical garden bells or rounded posts. Like all AMP® LED deck lights, this fixture does not project light above the horizon (full cutoff designation) making it Dark Sky compliant. The region of illumination is semi-circular and extends outward with even distribution and soft edges.